Yasuhiro Hayakawa, Deputy Director of the Center for Conservation Science, explained the work being done at the Center. Ms. KOKATSU, who was involved in the planning of the 1997 “Floating Images of Women in Art History: from the Birth of the Feminism toward the Dissolution of the Gender” exhibition at the Tochigi Prefectural Museum of Fine Arts, is also party to the ensuing “gender debate” that the exhibition helped to ignite. What emerged from the debate was the perspective of whether “art” exists as a separate world, cut off from real-world society. 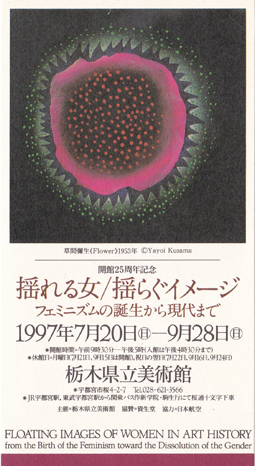 Ms. KOKATSU says such differences in perspective are prevalent in art circles even today. One example of coordinated movement by society and art might be the involvement of art historians in the protests against the “gender-free bashing” that became a social problem from 2004 to ’06. After the presentation, Ms.Midori YAMAMURA (Special Researcher, Japan Society for the Promotion of Science) spoke about the current state of gender studies in the USA. Ms.Maki KANEKO (University of Kansas) and Ms. Ryoko MIZUNO (Japan Women’s University) were also in attendance, with Ms.MIZUNO presenting some examples of the gender perspective in Japanese classical art studies. A multifaceted exchange of views took place in relation to art and gender. For a summary of KOKATSU’s presentation, please refer to Vol. 12 of Gender History issued in 2016. The launch ceremony also featured the rite of “funa-kabuse,” in which the boat is capsized three times to pray for its safety on the water. The “Cormorant Fishing Boat Project,” which has been underway at the Gifu Academy of Forest Science and Culture from May 22, has been successfully completed. The 13-meter-long cormorant boat was displayed at a launch ceremony on July 22. 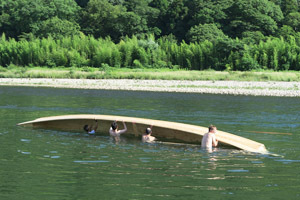 The aim of this Project was to record and inherit boat-building techniques while actually engaging in building a cormorant boat, with the participation of American boat builder Douglas Brooks, under the guidance of boat builder Seiichi Nasu (86) of Mino City, Gifu Prefecture (also refer to our May 2017 Activities Report). Also participating were American naval architect Marc Bauer and Gifu Academy furniture student Satoshi Koyama. The boat-building process was open to the public in the shelter structure built within the Academy premises. Tobunken served in the roles of research and documentation, taking video records of virtually the entire building process. Going forward, we will be editing and assembling the records in a way that will be useful for acquiring the necessary building techniques, and plan to co-author written and video reports with Mr. Brooks by the end of the next fiscal year. While the Project itself has come to a conclusion, the utilization, transmission, and dissemination of cormorant boats and their building techniques will continue across many fields. 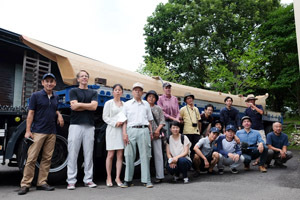 The cormorant boat built in the Project will be purchased by Yui no Fune, an organization that offers guided boat tours of Nagara River, and will be used to introduce river boat culture to the general public. 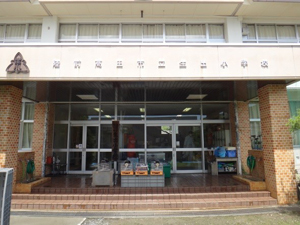 Meanwhile, at Gifu Academy, work is underway to explore how smaller, more manageable boats can be made using the traditional techniques learned in the Project. Since techniques will not be handed down if there is no demand for them, there is a need for flexible thinking to devise boats that meet contemporary needs and interests. The transmission of living techniques requires not only the compilation of academic records but also efforts to utilize them in contemporary ways and to make them more widely known to the general public. Tobunken intends to continue working with organizations and experts in a wide range of disciplines to explore better ways of transmitting these techniques. From July 6 to 31, 2017, conservation and restoration work was carried out on the outer walls of Me-taw-ya (No. 1205) temple on the Bagan Archaeological Site in Myanmar with the main objective of protecting the murals from rain damage. Based on the results of scientific analysis and physical testing of the various materials composing the temple, which had been conducted since FY2016, we re-assessed the problematic restoration materials and methods currently used. We then worked to restore the places most damaged by last year’s earthquake, and successfully completed our task with consideration given to compatibility between old and new materials. On the request of the Myanmar Ministry of Religious Affairs and Culture, we also made a presentation at the 10th Expert Meeting on Earthquake Damage to the Bagan Archaeological Site held on July 27, giving a report on our activities to date. This resulted in our work being highly commended for its utility in the context of today’s urgent need for restoration initiatives for the Bagan Site, and we were asked to further intensify our cooperation going forward. In part to respond to these requests, we plan to continue with our consistent program of conservation and restoration, as well as to communicate repeatedly with local experts in order to construct conservation and restoration policies suited to the Bagan Archaeological Site. These workshops are held annually for the purpose of preservation and utilization of Japanese art objects such as paintings and calligraphic works overseas, and the promotion of understanding of these objects. In this year, the basic course “Japanese Paper and Silk Cultural Properties” was conducted from July 5th to 7th, 2017 and the advanced course “Restoration of Japanese Folding Screens” from the 10th to 14th at the Asian Art Museum, National Museums in Berlin (Museum für Asiatische Kunst, Staatliche Museen zu Berlin) with the support of the Asian Art Museum and Museum of Technology (Deutsches Technikmuseum). In the basic course, 11 restorers, conservators and students from seven countries participated. This course included lectures on the materials used for the cultural properties, such as adhesives, mineral pigments and paper. Practical works on painting on silk, Chinese ink painting and handling hanging scrolls were also conducted. In the advanced course, instructors from a certificated group holding the Selected Conservation Techniques “restoration techniques for mounts” gave practical works and lectures to nine restorers from six countries. This course aimed to provide a method in which Japanese folding screens are conserved using the traditional technique. The participants could understand the structure and functions of a folding screen by accomplishing processes from the underlying work to the application of the final surface paper. Discussions were held in both courses actively. In addition to a question and answer session, opinions about restoration and applications of Japanese techniques and materials were exchanged. Similar projects will be implemented with the aim of contribution of the preservation and utilization of Japan’s tangible and intangible cultural properties overseas by sharing information about conservation materials and techniques in Japan with conservators overseas. The 41st Session of the World Heritage Committee was convened in Krakow, Poland from July 2 to 12, 2017. Tobunken staff attended the meetings and gathered information on trends relating to the implementation of the World Heritage Convention. In discussions relating to inscription on the World Heritage List, it was striking that many cases were decided to be inscribed against the recommendations of the Advisory Bodies. Twenty-one sites were newly inscribed during the Session, but only 13 of them, including Japan’s Sacred Island of Okinoshima and Associated Sites in the Munakata Region, were considered worthy of inscription by the Advisory Bodies. Some have pointed out that such reversing of the recommendations of the Advisory Bodies stems from their experts lacking a thorough understanding of the dossiers and additional information submitted by the States Parties. Others caution that the Committee Members, conscious of the various benefits that inscription on the World Heritage List imparts, are prioritizing political agendas over the assessment of experts. During the meetings, the chairperson repeatedly voiced his concerns over the politicization of the Committee discussions, but the direction of the discussions did not change significantly. The States Parties to the World Heritage Convention have a duty to protect the World Heritage sites in their respective countries. When sites are inscribed on the World Heritage List before sufficient systems are in place for their protection and conservation, or in the absence of appropriate boundary and/or buffer zones of the property, it becomes difficult to fulfill this duty. The politicization of the World Heritage Committee no doubt reflects the high level of interest in World Heritage on the part of the States Parties. However, we felt that it was imperative for each State Party to act on the basis of expert knowledge necessary for the protection of their World Heritage sites, so that this high level of interest does not result in more harm done than good. The Tokyo National Research Institute for Cultural Properties is providing technical support to the Authority for the Protection and Management of Angkor and the Region of Siem Reap (hereafter APSARA) to draft a plan for the conservation and management of Ta Nei Temple. From July 16 to 30, 2017, we carried out an archaeological excavation and risk assessment of the buildings (Figure 1). Our excavation was mainly to identify remains of the East Approach to the temple, located at its front. We worked with APSARA staff with the cooperation of the Nara National Research Institute for Cultural Properties. 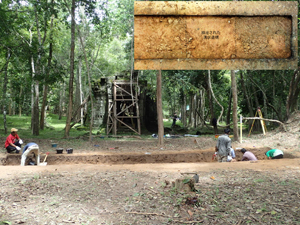 When we cleared the underbrush along about 100 meters from the Eastern Gate of the outer enclosure to the East Baray reservoir, we discovered remains of a laterite terrace on the bank of the reservoir, suggesting the high likelihood of this location being the starting point for an approach leading to the Eastern Gate. We first opened a trench measuring 2 meters east-west and 10 meters north-south about 12 meters east of the Eastern Gate (Figure 2). Our excavations revealed a ditch running east-west 50 cm below the current ground level. The ditch was about 2 meters wide and filled with amounts of fine chips of laterite (1cm-0.5cm in diameter), suggesting the possibility of an approach. In addition, both sides of the ditch were covered with fist-sized sandstone cobbles. For the purpose of finding the rest of this ditch as well as to verify the initial ground level, we opened a trench measuring 2 meters east-west and 2.5 meters north-south along the Eastern Gate and dug down. This trench revealed a sandstone cobbles covered surface that spread out over the entire surface 50 cm under the current ground level, and we were unable to detect any remains of the ditch. We are planning another excavation in November to determine further details of the Eastern Approach and to identify the entirety of the newly discovered terrace-like remains. One of the major charms of Ta Nei Temple is its ancient ruin-like setting, relatively untouched by human hand compared to other Angkor ruins. On the other hand, there is a need to prevent further collapse, in part to ensure the safety of visitors. Therefore, it is urgent for support structures to be installed and updated in a planned, organized manner on the basis of structural risk assessment of the overall temple complex. We decided to create elevation maps using SfM and conduct a risk assessment starting from the major buildings along the central axis. We started with two buildings with which we worked to establish the procedures for such operations. This work is currently being continued by APSARA staff. To preserve the buildings and surroundings in good condition, as well as to help visitors to the area better understand the significance and value of the site, we wish to intensify our cooperation toward academic elucidation and achievement of effective conservation.